The Fund took delivery of a beautifully made driver's pedestal for the loco's cab last weekend. It was delivered to Bridgnorth on Monday 23rd February and is pictured here. This is a feature of all the Riddles BR Standard classes, and was designed to offer drivers maximum ergonomic efficiency. 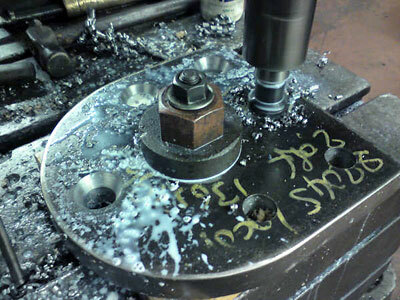 Controls located on the pedestal are (on the top) the driver's brake valve, and - from top to bottom on the side facing the bunker - the blower valve, sanding valve and vacuum release plunger. The pedestal was built by Sheffield-based engineer Dave Hewson. 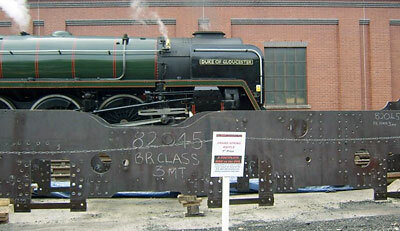 Don't forget that we are running a raffle on our stand at both March SVR events: 7-8th and 28-29th March. Tickets cost £5 for a book of five, all proceeds going to 82045. First Prize is a 32-mile SVR round trip on the footplate (date and loco to be arranged), so don't miss this rare opportunity to experience the Valley from an engineman's perspective! Other prizes include; 1st and 3rd class return SVR tickets, M&S gift vouchers and 82045 caps. Please send Barbara a stamped addressed envelope and state how many books of raffle tickets you would like. Bachmann Europe PLC is to produce an OO scale BR Standard Class 3MT 2-6-2T locomotive. 45 locomotives were built between April 1952 and August 1955 at Swindon Works. It was originally intended to build 63 locomotives but the order for the additional locomotives was cancelled following publication of the Modernisation Plan in 1955. The class were used on branch line passenger and freight services on the North-Eastern, Southern and Western Regions of British Railways. With the introduction of diesel multiple units and the widespread closure of many branch line routes they were destined for a short operating life. The first was withdrawn in February 1964 and the last in July 1967. Although none were preserved, 82045 Locomotive Fund is currently working on producing a replica for which a number of parts have already been acquired and manufactured. Three models will be released initially; two green versions No 82005 in BR lined green with late crest (31-976), No 820016 in BR lined green with early emblem (31-975) and No 82016 in BR black livery with late crest (31-977). These new models will incorporate an 8 pin decoder DCC socket. 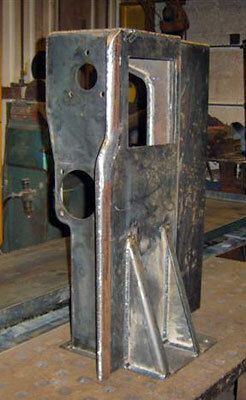 Good progress being made on the rear firebox support bracket. All the basic shaping is complete, the final work on the second of two coreboxes is nearing completion and the second batch of leather fillet is being applied. Paint will almost certainly be applied this weekend or next. If anyone would like to sponsor the casting of this bracket we would be very pleased to hear from you! Contact info. 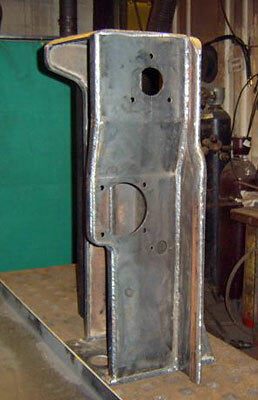 The newly fabricated Brake pedestal. 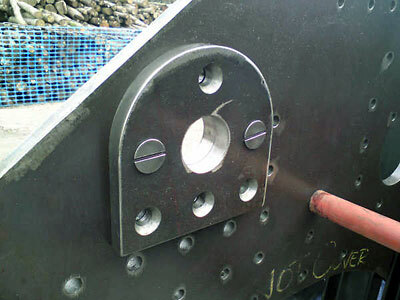 The front lifting liners are shown here being drilled at Bridgnorth on 28th February and then temporarily bolted into position on the inside of the frames. 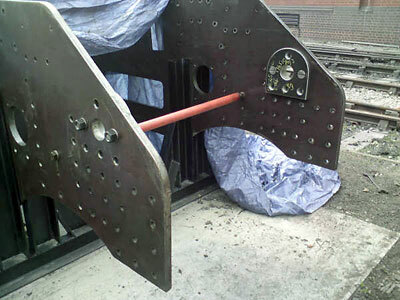 The liners are fitted to prevent damage to the frames when the locomotive is lifted by crane. Both front and rear lifting liners are now in situ on 82045's frames and await riveting. 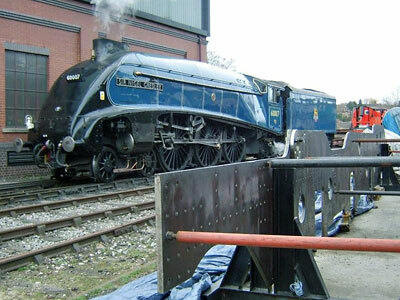 Visiting loco's at the SVR"s Festival of Steam weekend - 71000 Duke of Gloucester overlooks his embryo little brother! 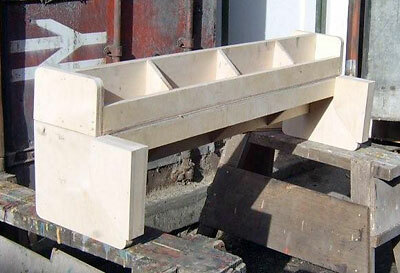 The pattern for the firebox support bracket takes shape.